Dog Carriers for Labradors: What's the Top Choice for Your Pet Lab? Dog Carriers for Labradors: What’s the Top Choice for Your Pet Lab? 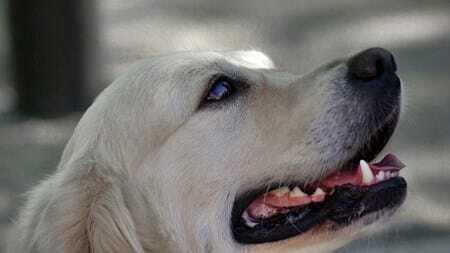 Labradors have always been a beloved family pet, and one of the most popular breeds of dog of all time. These beautiful animals are incredibly loyal and loving, with a real sense of intelligence and a great way with small children. If you’ve ever had a Labrador, you’ll know that they become part of the family very quickly – so if you’re going away for a while, you might not want to leave your furry friend behind. Some dogs may experience anxiety if they are left behind, even if it’s only for a few hours. Male Labradors can grow up to 62cm in height and weigh as much as 32kg – but with the right equipment, you too can carry your canine pal with you wherever you go. Pet carriers are a great way to transport your dog from one place to another, whether it’s on a road trip, an overseas flight or even to the vets. In this article, we’re going to take a look at some of the very best dog carriers for Labradors on the market. We’ll also look at how you can make travel easier and less stressful for your dog so that everyone can enjoy their trip without anxiety or panic. 1.1 What’s the Best Dog Carrier for a Labrador? For many people, the thought of taking their Labrador on a train, a bus or even a plane can be too stressful. You might also worry that your dog will become anxious on the journey. There’s nothing worse than a panicking dog when your plane is starting to head down the runway. The good news is that there’s no reason why you shouldn’t travel with your Labrador, whether it’s by public transport, on a plane or in your family vehicle. It can take some time for dogs to become familiar with travel, but once they do, it’s plain sailing. If you’re planning to take your Labrador with you on a long journey in the future, why not practice with some shorter trips to get them ready for it? Travel in short bursts can help pets become accustomed to the sensations of traveling. It will also help them get used to the carrier you’ve chosen for them. You might find that on the shorter preparation journeys, your pet shows signs of travel sickness or anxiety. If this persists, despite your best efforts, you should see your dog’s vet. They can often prescribe supplements or solutions that can help calm your furry friend and ensure that they don’t have a stressful or sickness-inducing journey. What’s the Best Dog Carrier for a Labrador? Before you choose a pet carrier, it’s important to think about what type of journeys you’ll be taking with it. If you’re going to stick with your vehicle and maybe some occasional public transport, you might need to think about factors like keeping your pet from knocking into the side of the carrier while on bumpy roads. If you’re planning to travel by plane and need a dog carrier that is suitable, you’ll need to bear in mind the rules for flying with a dog carrier. The carrier itself will need to be able to fold down, and it must be within the physical limits for a carry-on bag. Your life will also be made much easier if the carrier has wheels – airports involve a lot of walking, and your Labrador is likely quite heavy. As a dog-owner, you naturally want what’s best for your four-legged friend. 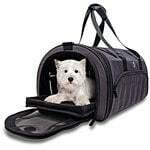 You don’t want to settle for a sub-standard dog carrier that’s going to cause your pet discomfort. Here are some of the top dog carriers for Labradors, and other dogs in a similar size range. This best-selling pet ‘port-a-crate’ is the ideal transportation system for dogs weighing up to 70 pounds in weight – which works out at just over 31kg. Most Labradors will come under this weight bracket, so the Petnation Port-A-Crate E2 Indoor Pet Home is a great choice for those with Labs in their home. The pet carrier is made from heavy-duty tight weave mesh fabric, surrounding a robust steel frame. This enduring, strong structure means you’ll have no worries about it breaking down, or your pet performing a daring escape attempt. Mesh windows are surrounding the exterior to encourage airflow for your dog, and there are two doors (one on the front, one on the top) for easy access. The Petnation crate is also easy to set up and fold down when not in use. The carrier is delivered entirely flat. All you need to do is release the clips on the side, then gently pull on the front and back panels to turn the flat pack crate into a portable home for your dog. The top bar must then be assembled carefully, with closure sleeves sliding over the connection until the frame is completely rigid. This Labrador carrier has been very popular with customers. Indeed, some say that their dogs now prefer the crate to their regular beds. 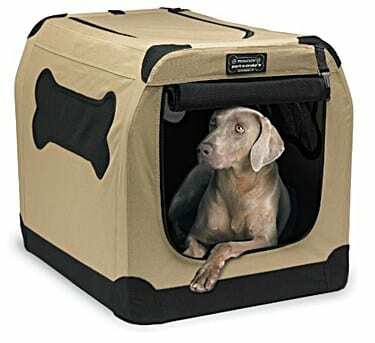 Check the Price of the Petnation Port-A-Crate E2 Indoor Pet Home on Amazon! 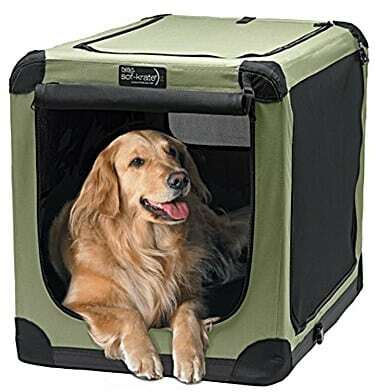 This durable pet crate for indoor or outdoor use is very similar to the Petnation option, at a slightly lower price point. It’s suitable for dogs of Labrador size (up to 70 pounds) and comes with all the excellent features you might expect from a favorite, well-reviewed pet carrier. The NOZTONOZ Sof-Krate Pet Home sets up in seconds, making it the ideal travel companion for you and your dog. It’s made from the same combination of tight-weave mesh fabric and steel as the Petnation carrier, and is well-ventilated, meaning it’s great when your Labrador needs a few moments to cool down. The entire pet home is washable and has a water-resistant base. If you’re taking your dog on a camping trip, you don’t need to worry about them getting too muddy. You can wash their pet crate when you return home. The corners of the crate have also been designed to be kind to interiors, both in your car and your home. They’re slightly rounded, so they can’t catch on your upholstered seats or other furniture. Check the Price of the NOZTONOZ Soft-Krate Pet Home on Amazon! 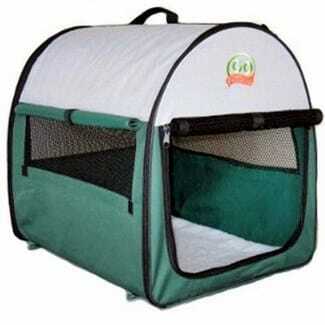 The Go Pet Club Soft Pet Crate is another excellent option with hundreds of positive reviews from happy customers. 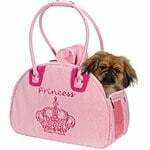 One of the best things about this pet carrier is the sheer variety of sizes that are available. For Labradors, you’d likely need a Medium. But if you have a particularly large dog, or if you want to give them a little extra space to move around, you can opt for a Large. This crate is made from heavy-duty water-resistant polyester with PVC backing and mesh doors to provide ventilation. It folds down to as little as 2-inches thick, which is ideal if you’re taking it as a carry-on bag on your next plane journey. The crate also comes with a removable lambs’ wool floor pad, ensuring your pet will be comfortable when they travel. This crate isn’t as hard wearing as some of the other options on the market, but if you’re only planning to take your Labrador on shorter journeys, it’s ideal. Check the Price of the Go Pet Club Soft Pet Crate on Amazon! If you’re flying, check your airline’s policy about flying with dogs way in advance. There might be a limit to the number of dogs they have in the cabin, and they may require that you buy an extra seat for your dog to sit in on the plane – there are rules and regulations that you may need to follow. Make sure you scope out the location and contact details of a vet at your destination ahead of time. If you’re staying in a hotel, check that it’s dog-friendly before you book. Hotels may also have strict rules on where your dog is supposed to stay. Give your dog something to keep them occupied during the journey. Chew toys (not noisy ones) are a great option, as they can lie in their crate and enjoy the treat without needing to move around too much. Traveling with your Labrador dog doesn’t have to be a stressful experience. If you crate-train your dog from as young as possible, they’ll become accustomed to the sights, sounds, and sensations of traveling much more easily. If you already have an older dog, take it slow – travel can be scary for those who have only ever used their own four legs to get from A to B. With the right carrying equipment, there’s no reason why traveling with Labradors can’t be a great success for everyone involved. Make sure your dog has plenty of room and is comfortable before you set off, and be sure to plan bathroom breaks to avoid accidents. Best Pet Carrier with Top Opening Door: Our Advice & Top Picks!